This movie is based on the best-selling children’s book, The Gruffalo. It is a magical tale of a cute mouse who takes a stroll through the woods. He encounters three predators who all want to eat him up! But, the adorable mouse has to use his wits to survive this. He tells his predators that he is meeting a monster, and this scares his predators! But, what will the mouse do, when he comes face to face with the terrible product of his imagination?? 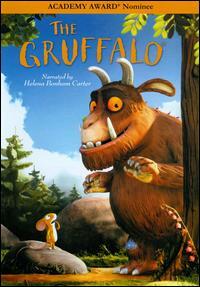 This is narrated by Helena Bonham Carter and The Gruffalo is a 2010 Academy Award Nominee! The Gruffalo will be available at your local retailer or at www.NCircleEntertainment.com on August 16th! My kids really liked this movie. My son thought the world of the brave mouse and my daughter really enjoyed the predators! This movie is 40 minutes long and will retail for only $9.99. One lucky individual will win a copy of the cute movie, The Gruffalo! Easy! Just use Rafflecopter below!